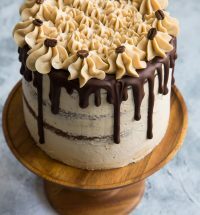 This Espresso Chocolate Cake has four layers of dark chocolate cake frosted with espresso buttercream and topped with melted chocolate. When things go awry, I bake a cake and I usually feel better. But this time, I couldn’t. 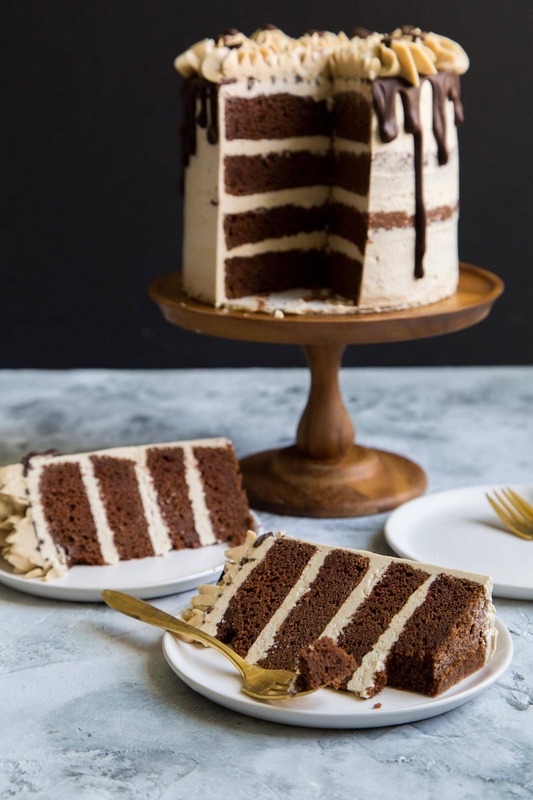 I desperately wanted to make this espresso chocolate cake. I couldn’t bake anything because my oven was the problem. It’s been a while since I last shared a cake recipe. I had major issues with my oven these last few weeks. I knew something was wonky when the oven couldn’t regulate its temperature. I’d set it to 350 and it wouldn’t stop heating until way past 500 degrees F. (Note: you should have an oven thermometer so you can monitor the temperature.) That went on a week or so. And then, catastrophe finally ensued. The oven refused to turn off and the entire kitchen reeked of gas. We had to shut off the gas and I couldn’t use the oven for weeks while we waited for replacement parts to be shipped. Luckily, everything has been solved and my oven is back to normal (for now). 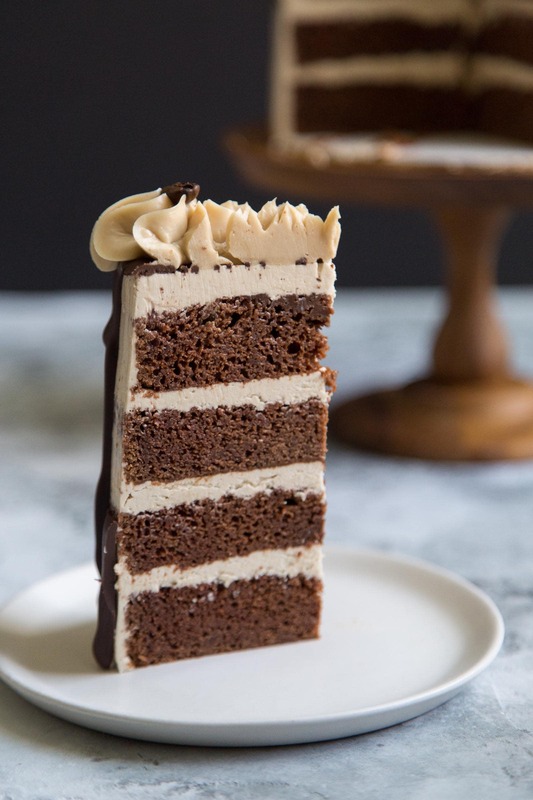 We can sit back, relax, and enjoy the long weekend with a few slices of this espresso chocolate cake. 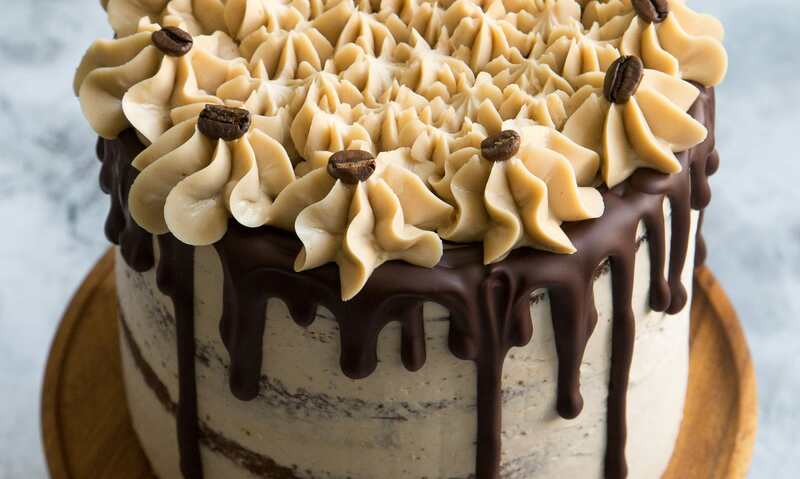 Four layers of dark chocolate cake frosted with espresso Swiss buttercream, all topped with melted dark chocolate. It’s just the kind of cake I want (need) with my afternoon iced coffee. It’s perfect for any season and suitable for all sorts of occasions, even random weekdays. I used my go-to chocolate cake recipe. It’s the same one used in this caramel fig chocolate cake. It’s my favorite chocolate cake recipe because it can be made ahead of time and stored in the freezer for a couple weeks. Because the recipe uses coconut oil instead of butter, the texture of the cake remains nice and soft. The flavor from the coconut oil is mild and subtle. If anything, it adds a bit of mystery to the assembled cake. Preheat oven to 350ºF. Line two 6-inch round cake pans with parchment paper. Lightly grease and set aside. In the bowl of a stand mixer fitted with a paddle attachment, mix together coconut oil, sugar, espresso powder, eggs, and vanilla until well combined. On low speed alternate adding dry flour mixture and milk. Add about 1/3 of flour, following with 1/2 of milk. Add another 1/3 of flour and remaining milk. Scrape down bowl as needed to ensure thorough mixing. Add sour cream and remaining flour. Mix on low speed until there are no longer any streaks of dry flour. Divide batter between prepared cake pans. Level batter. Bake for 28-30 minutes until toothpick inserted in center of cake comes out clean. Allow cake to cool in pan for 5 minutes before unmolding. Allow cakes to cool to room temperature on wire rack. In the bowl of a stand mixer, whisk together egg whites and sugar. Place bowl of a pot of simmer water to create a double boiler. Make sure simmering water does not touch the bowl. Heat sugar egg mixture until it reaches a temperature of 160ºF, whisking often to ensure even heating. Alternatively, if you don't have a thermometer, heat until all the sugar has melted. You can test this by rubbing mixture between your fingers. The mixture should be smooth. You should not be able to feel the granules of sugar. Return bowl to stand mixer. Using a whisk attachment, beat mixture at medium speed until it has cooled to 75ºF (about room temperature). Add in espresso powder and salt. Reduce speed to low and add butter one tablespoon at a time. Once all the butter has been added, increase speed to medium-high and continue to beat until buttercream is light and fluffy. Once cake is cooled, slice each cake into two equal layers. To build the cake, place one layer on a serving platter or cake turntable. 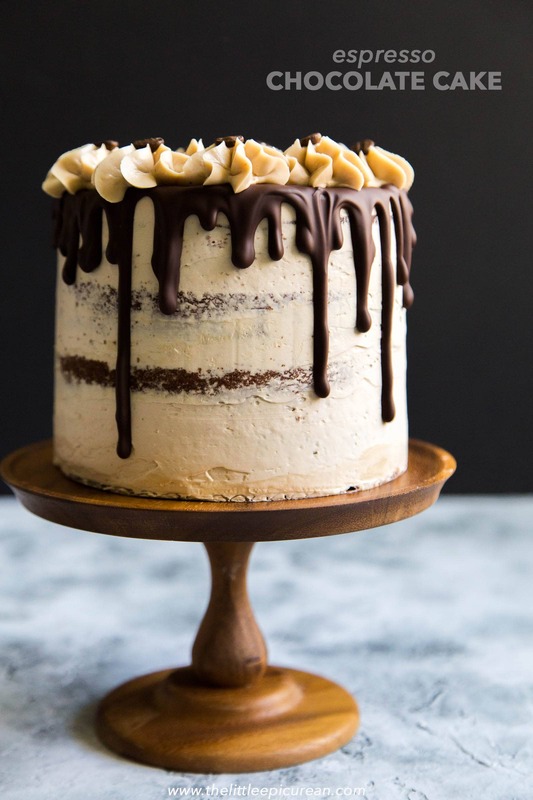 Spread a layer of espresso buttercream. Place another cake layer on top and repeat until you have the fourth cake layer on top. Spread a thin layer of buttercream around the sides of the cake to seal in the crumbs (crumb coat). Place in the fridge and allow to chill for 15 minutes to set the buttercream. 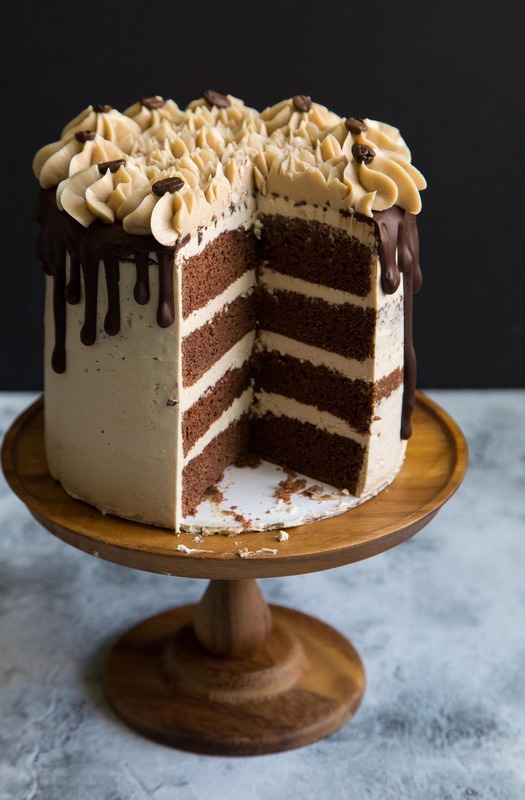 If desired, coat cake with another layer of buttercream. Drizzle melted chocolate along sides of the cake. Place remaining buttercream in a pipping bag fitted with a large star tip. Pipe large stars on top surface of cake. Decorate with coffee beans. Keep cake chilled until ready to serve. Allow cake to warm to room temperature before eating. Chocolate cake can be baked in advance. Cool to room temperature, then tightly wrap in plastic wrap. Keep cake in the freezer for up to two weeks. To defrost frozen cake, allow to thaw at room temperature overnight. Talk about perfection! This is gorgeous and looks beyond delicious. Definitely need to try! This looks absolutely incredible- so gorgeous and obviously so delicious too. Desperate to try it out! 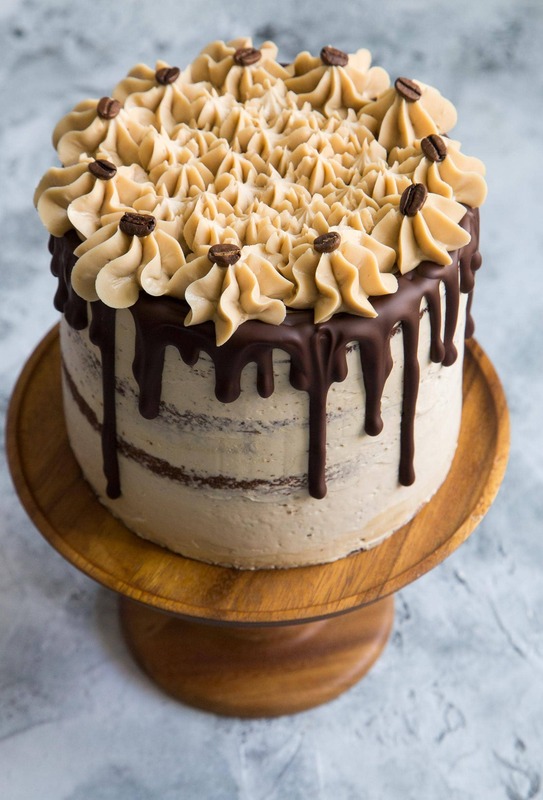 Such a beautiful and tasty looking cake! What can I substitute coconut oil if i don’t have any? You can use softened unsalted butter. Thanks for trying out the recipe! Yes, the amount of butter used in some buttercream recipes is a bit alarming. Sometimes when it comes to eating buttercream- ignorance is bliss! I followed the recipe religiously and it turned out beautiful. Love this site so much. Thanks for sharing this so detail, really appreciate that. That’s wonderful to hear! Thank you for trying out the recipe. I’m so glad you enjoyed it! You could use whole milk yogurt, Greek yogurt, or creme fraiche in place of sour cream. I use Civilized Coffee Espresso Powder it is 100%Colombian – I got it on Amazon. It is amazing.